WHAT I KNOW ABOUT OLD CLOCKS WOULD FIT IN THE THIMBLE OF TURPENTINE THAT I WAS TOLD TO PUT IN THE BOTTOM OF THE CLOCK TO LUBRICATE THE WORKS???? I FOUND THE CLOCK IN MY MOTHER-IN LAWS ATTIC AND IT WAS NOT WORKING SO I TOOK IT OUT OF THE CASE AND CLEANED THE TAR LIKE STUFF OFF THE GEARS AND NOW IT IS RUNNING JUST FINE. I HAVE TO FINE TUNE IT YET; IT IS RUNNING 4MIN. FAST IN 24 HRs, SO WILL TURN IT DOWN A HAIR. THE ONLY MARKS ON THE CLOCK ARE SIX NUMBERS 168965 ON THE BACK OF THE WORKS .THE FACE IS PORCELAIN ABOUT 3 & 3/4" AND THE PENDULUM IS BRASS 2" ROUND WITH ABOUT 7/8" R=A LOOKS LIKE PORCELAIN CENTER PIECE. I WAS TOLD THAT IT IS REAL OLD BUT HAVE NO CLUE ABOUT THAT. IT HAS WIRE PINS HOLDING THE BACK PLATE OF THE WORKS IN PLACE THERE IS TWO FINGER SCREWS HOLDING THE WORKS TO THE FRAMEWORK THAT SUPPORTS THE PENDULUM, SO THE WORKS CAN BE TAKEN OUT WITH THE PENDULUM STAYING ON THE FRAME IN THE CASE. 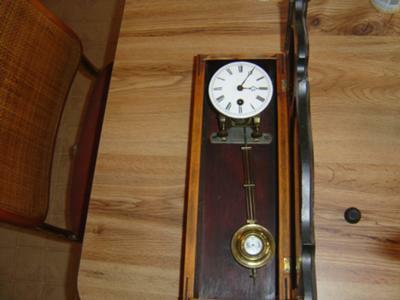 IT IS A VERY NICE LITTLE WALL CLOCK WITH NO CHIMES OR DINGING WHICH IS NICE ON THE NOISE EVERY HOUR. SO, IF ANYONE COULD PLEASE INFORM ME OF WHAT AGE OR KIND IT IS I WOULD BE FOREVER IN YOUR DEBT. THANK YOU FOR ANYTHING THAT YOU CAN TELL ME.